Lean moves through sectors in waves. It can safely be declared that the most mature application of lean thinking is within the automotive industry, the industry where it all began! Other sectors are altogether newer to the lean approach however. Most recently, there appears to be a current up-swell of interest in lean within the University and legal sectors for example. For the purpose of this article, I thought I’d briefly examine a sector which might, in some ways, be considered ancient in terms of its adoption of lean, the restaurant and café trade. Why ancient? Well one might say that restaurants and cafés have embraced lean, perhaps unknowingly, for some time because their sole purpose is to cater for customers’ needs and desires, to deliver customer value in direct response to customer demand. Success in the trade is therefore naturally attuned to the delivery of a lean approach. I was first alerted to this fact by a student on our MSc Lean Systems programme. Tal Weisman likened the successful running of a lean enterprise to the successful running of a restaurant (managing inventory, understanding capacity and customer demand, responding to customer orders within a speedy time frame etc.) Indeed, Dr Zoe Radnor used to compare Gordon Ramsey’s Kitchen Nightmares programme to that of a lean intervention. Firstly Gordon would experience customer value first hand by having a meal, then he’d start off cleaning down the kitchen (5S), focus on a simplified offering by rationalising the menu and focussing on quality by creating strong relationships with excellent suppliers etc. When trying to share lean knowledge, teachers often look to communicate relatable analogies in order to help people to better understand concepts and using the restaurant as a metaphor for a lean enterprise system works well. So, if we accept the restaurant as a metaphor for lean, by examining how the restaurant and café sector’s approach to delivering customer value is evolving, we might be given an insight into how lean in itself is evolving. For example, I recently read an interesting article which discusses a new operating model for that most familiar of catered services, the café. The article described how Ivan Mitin, an ‘entrepreneur’ (I use the word carefully as his quest seems to be more of an socially idealistic one as opposed to one driven solely by profit) has opened a new type of “anti-café” in London’s trendy Shoreditch called “Ziferblat”. This English enterprise follows a successful chain of “anti-cafés” that Mitin established in Russia. His anti-cafés provide people with a place where they can “build a small world of their own where the ‘stupid and artificial’ rules of society don’t work”. So how do these anti-café’s challenge societal norms? Well, they do not charge you £2.60 for a chai latté and £5.60 for a toasted, roasted vegetable flatbread ie the products that they have ‘for sale’. Instead, they charge you for the amount of time that you choose to spend in their establishment: relaxing, chatting and potentially planning social revolution. For £1.35 you could spend 45 minutes in their environs, helping yourself to a hot drink, fixing yourself a snack from food in the cupboard and chatting to your friends on your laptop using their wifi. When I first read the article the initial curiosity came from the prospect of a relaxed, uninhibited, different kind of space that would be full of cool hipsters and where I could help myself to free drinks and snacks, but as ever, my thoughts quickly turned to lean and I realised that Ivan has created an enterprise around a completely different, untraditional perception of customer value. Indeed, he states “It feels like people [in London] are much more tired of consumption and really happy not to be “clients” anymore”. He’s empowering people to be in charge of themselves in the café environment. The customer-supplier transaction that is taking place is merely providing the right kind of creative, comfortable space upon which “clients” can act however they like (I imagine, within reason!). Payment takes place aligned to customer value – the amount of time that people wish to be privy to this creative space. What a clever concept. When I think about what I value from a café, yes, it’s great to have a well-crafted cup of coffee, but actually, what I really appreciate is the time to stop, have a chat with a friend, to sit in a pleasant, cool environment and so paying ‘by the minute’ to be part of such an “anti” space would be very appealing. Of course, I haven’t seen Ivan’s accounts, I haven’t even visited one of his cafés, so I cannot attest for the success of such a ‘business model’, but it definitely made me think. Within the world of service, increasingly IT is used to provide the ability for customers to ‘self-serve’ and Ivan is, in a different way, doing just that – providing a ‘self-serve’ café experience which puts the price on what people reallyvalue – time. Let’s think more about the ‘self-serve’ concept. It’s increasingly apparent within the fast food industry. I was shocked recently when I entered the Cardiff branch of Mcdonalds to be greeted with a number of stations equipped with large touch screens. Ordering was encouraged from these stations, the screens enabled customers to efficiently browse through the menu, making your selection, adding sides and ‘going large’, to finally pay for your purchase, be issued a ticket number and your order is then served (by a human) to the delivery counter. Again, I considered the extent to which ‘lean’ can be detected within such a change. I thought of the jidoka principle or “automation with a human touch”. These interventions can surely be considered as a manifestation of jidoka within the world of service. They help to build quality as the customer is given complete control and visibility of order selection reducing the opportunity for ordering mistakes and let us not forget, in the same way that Sakichi Toyoda ‘automatic stop’ loom revolutionised cloth making (because now it was no longer necessary to employ one worker to watch one machine, now a factory could employ 1 worker to watch 20) automated systems in restaurants reduce the need for serving staff and effortlessly tackle that most annoying of service features, the queue. The humble takeaway has also been touched by the jidoka principle. 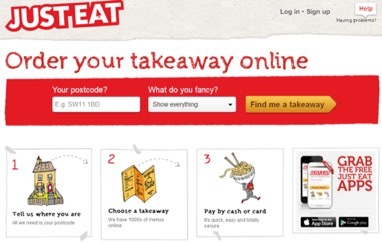 Take “justeat.com”. First launched in Denmark in 2001, it’s now the number 1 service of its kind in the UK. It offers a seamless customer “one stop shop” experience. You simply visit the website, enter your location, and it offers you a range of different take away options which deliver to your door. Again, the service offers complete visibility as customer choice as you select what items you want and see the dishes listed on the side of the computer screen as a shopping list, reducing the opportunity for error. Of course, restaurants and cafes are not just becoming computer driven efficient machines, customers are ever more sophisticated of palate and are not only wanting food and service of higher quality, but dining experiences which are special and unique. In the wake of horse meat scandals and mass floods potentially from climate change there is also increasing pressure placed by customers on catering establishments to ethically source their products. See for example this statement by new successful Cardiff burger restaurant “The Grazing Shed”, again echoing the lean and green trend that is pervasive at the moment. In truth, you can examine any sector and detect recurring innovation trends and evidence of an evolution in approach to operations management. This article has looked at but a few in the catering industry: 1) Reassessing your value proposition in order to offer customers something different, 2) harnessing the power of IT to offer self-service solutions, giving the customer visibility and control of their order and 3) an increasing need for social responsibility, environmental sensitivity and quality sourcing within the supply chain. Examine your own sector, can you determine similar trends? If not, perhaps maybe you should start to consider exploring them?